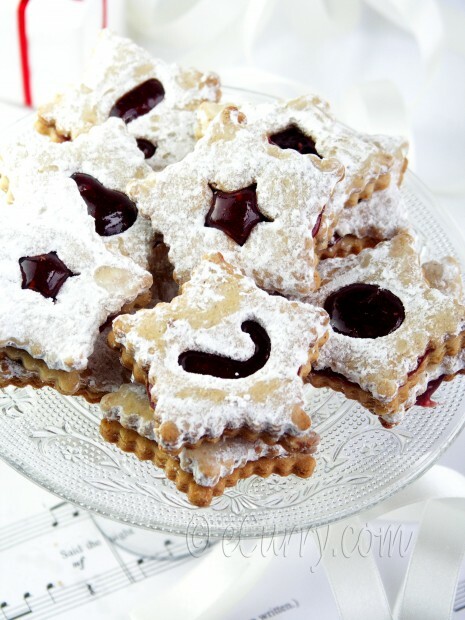 The Linzer cookies are derived from the famous Linzer Torte, which seemed to have originated in the town of Linz of Austria. The torte has given way to cute cookies and different kind of jam or preserves are used in place of the traditional black currant preserve. Personally I feel the red raspberry preserve gives the cookies a more appropriate look during the holiday season. Before I move on the cookie, I have an announcement to make and a Giveaway to follow. Now the best part is for my readers! Ivy has been very generous and is sending me 2 copies of this book, one for me to keep (yaaay!) and the other one for one lucky winner. I will announce the giveaway as soon as I receive the books. I had been baking all weekend. First these cookies, and then the all of a sudden urgency that I have not baked fruit cake this year led me to bake us two small loaves of a quick fruity bread (recipe coming up) almost right after the cookies. I churn my memories of childhood, and it never feels like the Christmas time without the smell of baking and the feel of a warm oven. It was a family affair; whisking, beating, scraping and kneading and of course the tasting. Then the loaded pans would be taken to the local bakery, for we did not own an oven to bake in that scale. So it feels like now, with my girls, together in the kitchen. Cookies bring warmth and happiness. There is nothing as delightful as watching a child’s face light up at the sight of a cookie. 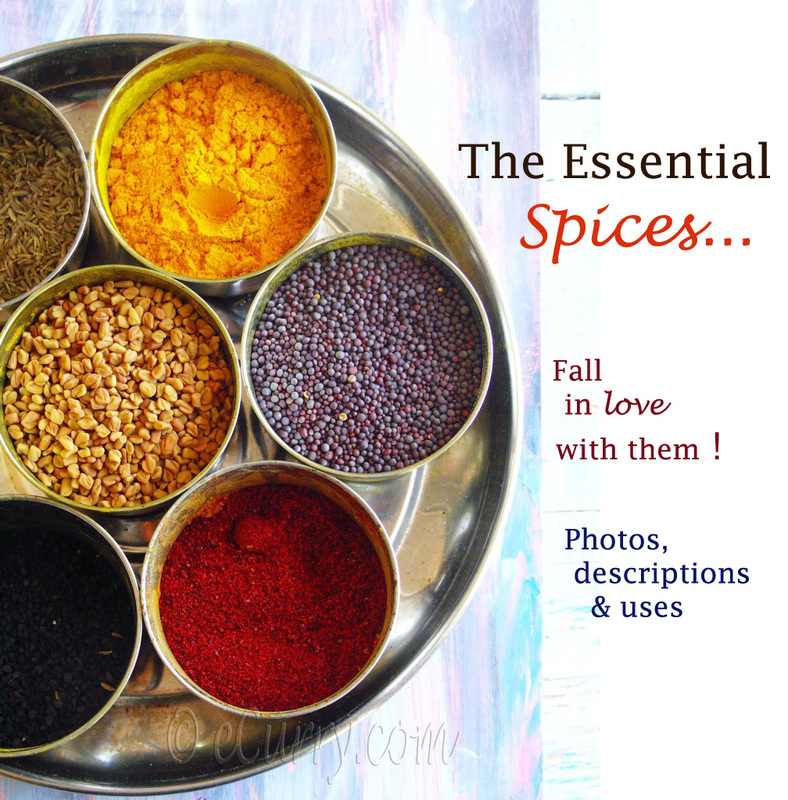 During the holiday season, they are extra special; a symbol of love, giving and sharing. 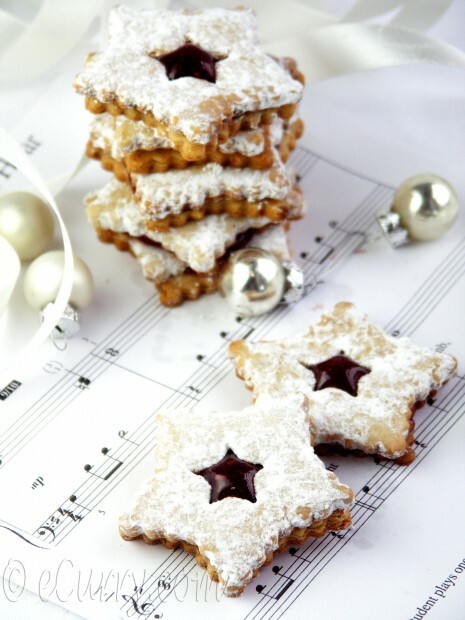 The Linzer cookies looked too good to give them a pass – soft, snowy, powdery white and peeked through the cut out was the red glossy jam – irresistible!.The time was just right, the kids begged and pleaded and I finally came around baking them. The girls picked out whatever cut outs they wanted and helped me stamp the cookies. And I am glad that I chose to bake these cookies, for they were very very pretty! To look at them was a joy, to bite into them was sheer bliss. 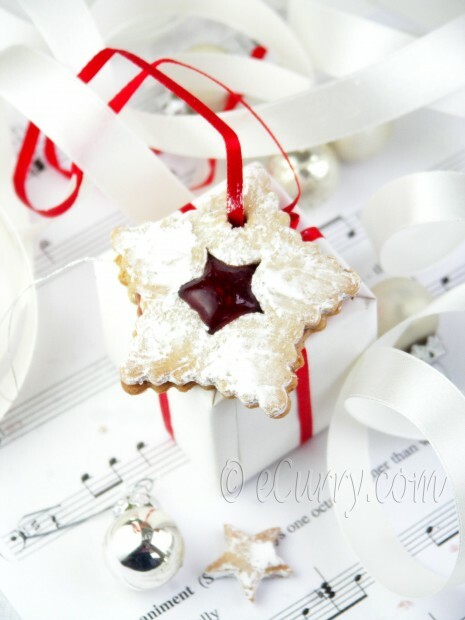 Thin, delicate, tender and crisp – beautifully dusted with snow and with the luscious spiced jam inside – these were some sophisticated desirable cookies. If you are using hazelnuts with skins, it would be a good idea to toast and skin them ahead of time. It takes a lot of time to skin the nuts. Chill, chill, chill the dough. It gets very very difficult to work with soft room temperature dough. Chill the dough while one set of cookies are baking, even if it is for 30 minutes. Watch the cookies while they are baking. 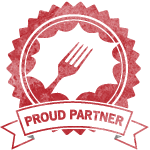 They cook really fast. I use a small convection oven and mine were done at 10 minutes. If you are wondering why the white on my cookies have a “smeared” look, it is due to my lack of patience. I cheated and instead of evenly dusting them, I placed the cookies in a big bowl full of confectioners sugar. 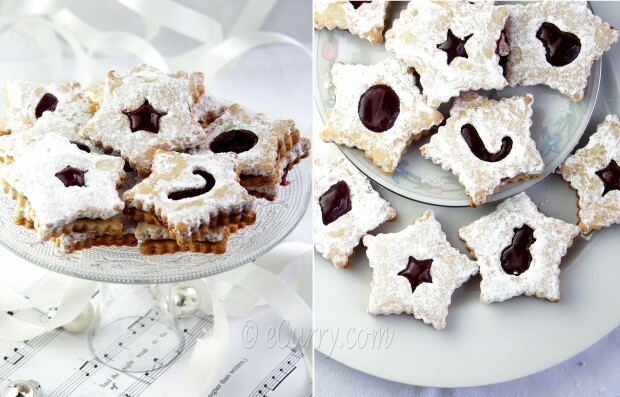 This recipe is a combination of Elise’s (Simply Recipes) Valentine Linzer Cookies, Epicurious, and Food and Wine (loved the Spiced Jam idea). Toast hazelnuts in a shallow baking pan until fragrant and skins begin to loosen, about 6 minutes. Or toast them on the stove top in a dry skillet at low flame for 5-7 minutes, while tossing them constantly. Rub the nuts in a towel to remove as much loose skin as you can (some skins may not come off), then cool to room temperature. If you are using blanched almonds you do not have to toast them. 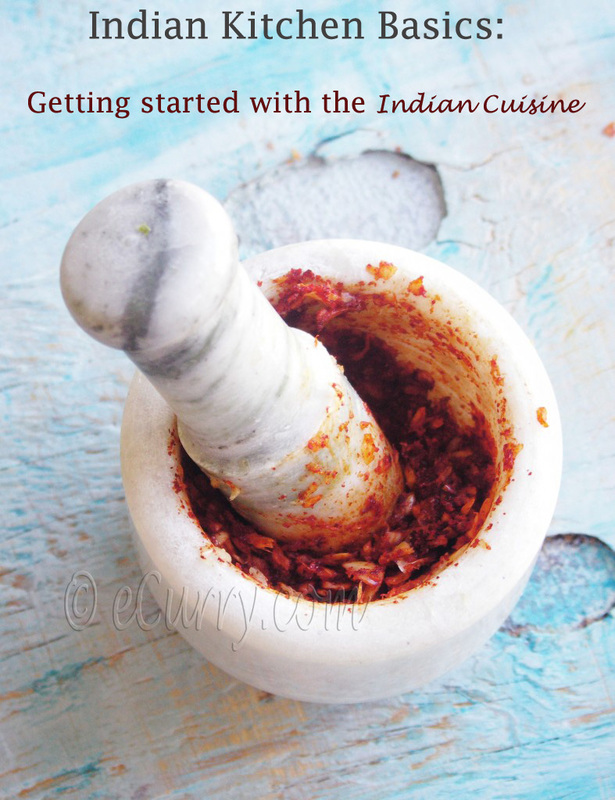 Rub the zest with your finger with the flour to release the oil. 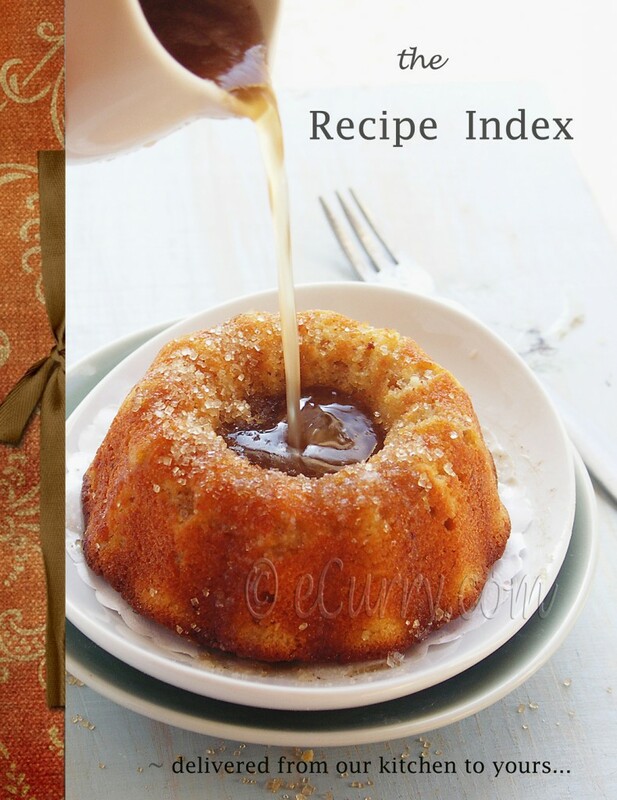 Whisk together flour, baking powder, salt, and cinnamon + clove + nutmeg powder in a bowl. Set aside. Beat together butter and remaining 1/4 cup brown sugar in a large bowl with an electric mixer at medium-high speed until pale and fluffy, about 3 minutes in a stand mixer or 6 minutes with a hand held mixer. Add nut mixture and beat until well combined, about a couple of minutes. Beat in egg and vanilla. Reduce speed to low and add flour mixture, mixing until just combined. With floured hands, gather up the dough and form dough into 2 balls and flatten each into a 6-inch disk. Chill disks, wrapped in plastic wrap, until firm, at least 2 hours. Roll out 1 disk of dough into an 5-6-inch round (1/6 inch thick) between 2 sheets of wax paper (keep remaining dough chilled). If dough becomes too soft to roll out, re-wrap in plastic and chill until firm. Use one disc to cut out the base (without the center hole) and the other disc to cut out the top cookie. ( I have used a Linzer cookie cutter, so I did not have to use a smaller cutter.) Make sure that you equal number of cookies, to pair the top and the bottom. Cut out as many cookies as possible from dough with the Linzer cookie cutter and transfer to 2 un-greased large baking sheets, arranging about 1 inch apart. Using smaller cutters, cut out centers from half of the cookies, reserving centers and re-rolling along with scraps (re-roll only once). Bake cookies, switching position of sheets halfway through baking, until edges are golden, 10 to 12 minutes total, then transfer with a metal spatula to racks to cool completely. Make more cookies from second disk in the same way as above. Make sure you dust the fronts with powdered sugar before you made the sandwich. Store in airtight container and they will stay good for a couple of days. But it is best if they are sandwiched with the jam/preserve right when you are ready to serve. 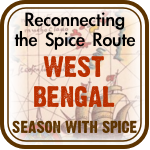 A crispy buttery delicacy with a spiced filling. Rich, but very very light and as you can imagine, they did not last very long. Oh what prettiness! Love every bit of the history and your perfect illustrative photography! Congratulations to your friend on her cookbook. 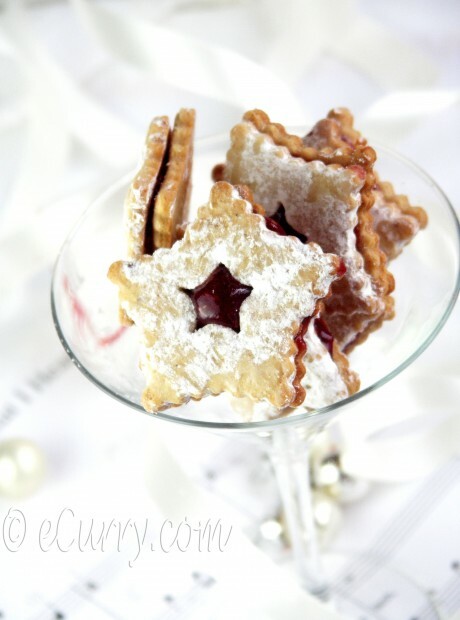 Linzer cookies with spiced jam! thats what I want this moment Soma. Loved the second picture 🙂 and how pretty is the cover of the book by Ivy. If the cover looks so exotic I can imagine how the rest of the book is! Wow. I love thse. I was planning to make these for Christmas. Actually ,I love baking cookies,different cookie each day truly makes it very festive and Christmassy. These were one of the selected ones. EXCELLENT Soma. Perfect and Christmassy. Waiting for your fruit bread. My bread dough is rising,Fingers Crossed it may turn out well. 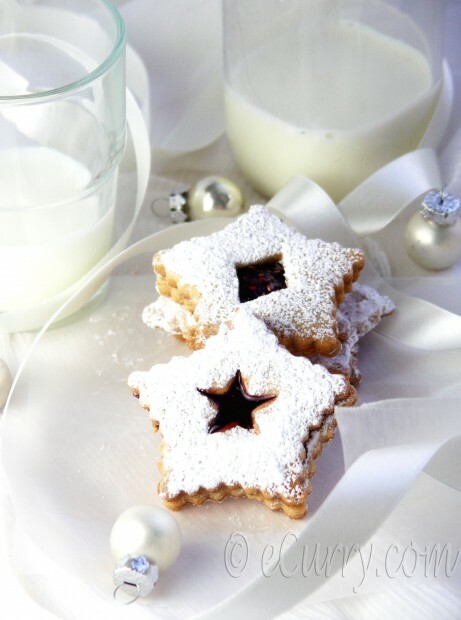 Pretty linzer cookies Soma :).. I am also planning to make these for my little one’s school Christmas party.. your’s look beautiful :)…. Dear Soma, your pictures are a treat to the eyes. Stunning and so elegant every one of them. I hope you all have Happy Holidays! have fun. Wow, that is so generous of Ivy! Those are wonderful cookies! A classic with a new twist. Thank you Soma for your kind words. 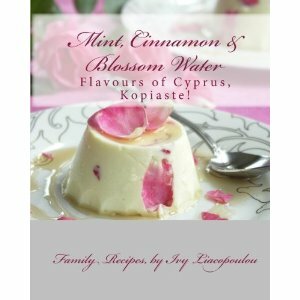 Soma is so modest that she did not take credit to mention that the beautiful cover of the cookbook, is one of her photos. 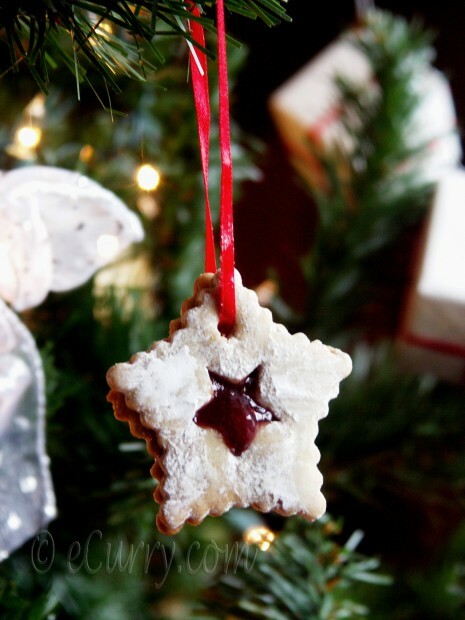 Such a great idea to make cookies based on Linzer torte and decorate your Christmas tree!! I don’t think that they would survive on the tree in my house until Christmas! Oh Ivy!! I did not do more than email you that photograph, and I cannot take credit for that. That awesome baby is all yours and your effort. No plans for a cookbook 🙂 yet! I do not think I can work as hard as you did. o and that was just one cookie on the tree, which was gone soon after. lovely !!! the pictures make it even more delicious !! such a pretty post soma! i adore linzertorte and the cookies are exceptional. these loove stunning! Soma, saw Ivy’s comment from above . The picture on the book looked so much like yours 🙂 Beautiful. These cookies are great. You are the best at presenting them Soma. Soma, isnt the book cover pic is from your blog? anyways you wont believe I have already baked a lot of these this year and I used almonds. they taste awesome. great clicks as always. Stunning pictures first of all and the cookies are looking great. The book look amazing. Wow…those cookies look gorgeous! I was gazing at them for so long. I have been wanting to make this for long an yours look so beautiful. And i am in love with the pic. Making of Linzer cookie seems to be lots of fun. Gorgeous pictures and Hanging the cookie to the Christmas tree is my favorite part. 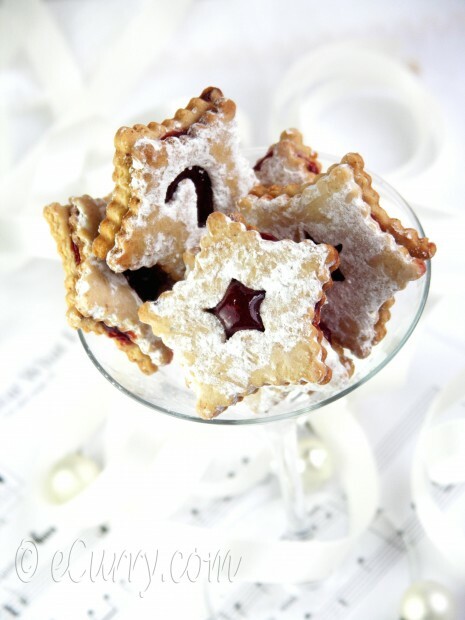 Your linzer cookies look so festive! This is one cookie I’ve always wanted to make but haven’t gotten to it yet. They look delicious, and I need to try making them soon. I love Linzer cookies. Yours look superb. so pretty!! you have done a great job styling these!! These are so stunningly gorgeous! I love your pictures very much! Oh wow, but look at them! They are so pretty and delicious looking, hehe. Thanks for the background and the recipe, I don’t think this year I’ll make any cookies, but I’ll definitely save the recipe for the next one. 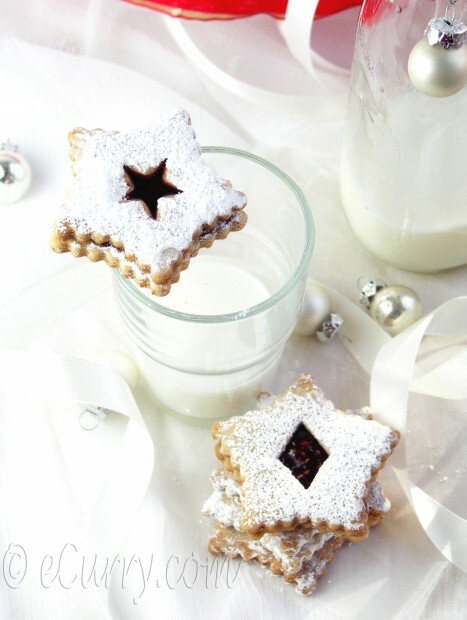 This linzer cookie is so pretty and so festive! Love the idea of poking a hole in it and tying it with a ribbon! Fantastic! I’m so tempted to take a few of these from the screen. They look so perfect ! A big congrats to Ivy! What a great accomplishment. These cookies are so pretty. I especially like the one hanging on the tree. Wish you and family happy holidays and a wonderful New Year too.